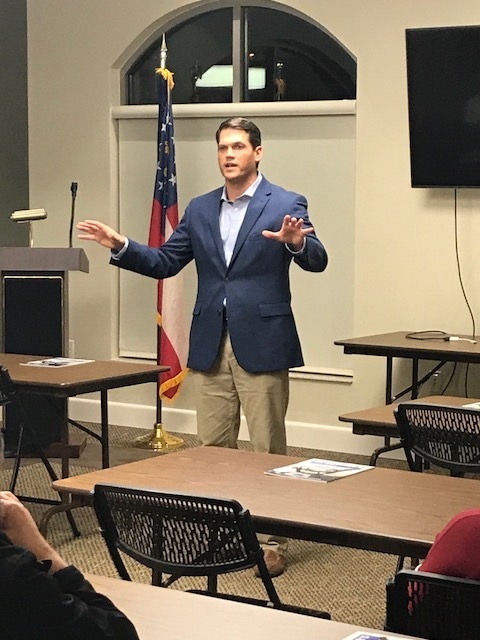 The Newton County Republican Party (NCRP) held its regular monthly meeting last night at the Covington Municipal Airport's Conference center. Approx. 40 persons attended this event that was conducted by NCRP Chair Scott Jay. After party business was attended to the assembled body heard from a few speakers, most notably Geoff Duncan, declared GOP candidate for Lt. Governor. In attendance were multiple elected officials including HD 112 Rep. Dave Belton, SD 17 Senator Brian Strickland, Newton Co. BOC-1 Commissioner Stan Edwards & Mansfield Councilman Brett Dunn. Duncan was the featured speaker for this event and gave a very good speech that was well received by several in attendance. One NCRP member that I spoke with after the meeting said, "I'm really impressed with Duncan...I think he'll be the one that I get behind." Duncan's speech highlighted his conservative values while playing up his status as the presumed underdog & "true conservative" to odds-on favorite David Shafer, who spoke to the NCRP a few months back. This writer was impressed, and as many have commented in the past - including a certain "local politician" - Duncan is easily the most handsome man running in any statewide race in the 2018 election cycle. Visit its webpage to get more information about the NCRP.